Season the quail with salt and pepper, then dredge in the flour, shaking off excess. Refrigerate the quail for about 1 hour. Melt the butter and honey together in a large bowl and add hot sauce to taste. Heat the oil to 375 degrees in a deep fryer or large pot and fry the quail in batches for about 4 minutes, or until golden. Remove the fried quail to a rack or absorbant towels to drain. 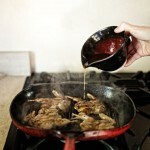 Once all of the quail are fried, toss them in the glaze and sprinkle with a little more salt. Serve immediately with the sliced peppers.